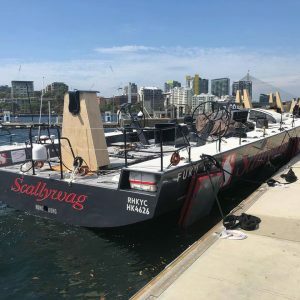 White Bay 6 Marine Park was very pleased to be able to host the 100ft supermaxi Scallywag at the beginning of January. Scallywag was being prepared to be shipped to the Caribbean and pulled alongside so the massive crane needed to pull the rig out could do so safely and easily. Once the rig was dismantled it was lowered back onto the yacht, packed on specially built racks, and motored down to Botany for shipping. Best of luck to the whole crew for their racing this year! 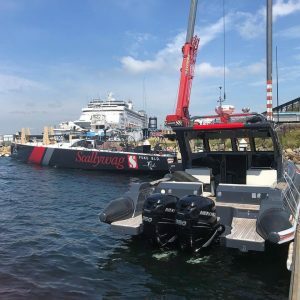 “Sun Hung Kai Scallywag, backed by Hong Kong-based Seng Huang Lee and Sun Hung Kai & Co. is the first ever Hong Kong entry into the Volvo Ocean Race (2017-2018). They also made history winning Leg 4 from Melbourne to Hong Kong for Hong Kong’s debut stopover. The goal for the owner and the team is raising and promoting competitive sailing in Asia, while building a long-lasting youth sailing legacy in Hong Kong in conjunction with the Hong Kong Sailing Federation. Led by the experienced heavy weather sailor, David Witt, and utilising his knowledge from over 20 years of his Sydney to Hobart Races history, he leads the SHK Scallywag crew.